Jays in the House: Let's Predict the Offseason! With a manager in place and a coaching staff starting to take shape, one of the Jays’ major offseason projects is almost complete. The roster work, however, has barely started, with a couple of no-brainer option decisions (yes to Smoak, no to Solarte) constituting the only real major league moves. With some clear strengths and weaknesses to the roster, management is in a position to have a busy offseason, and I suspect they’ll be extremely active on the trade front. 1) Devon Travis is traded for a reliever. It’ll be disappointing because we know what he’s capable of, but… do we? For a couple years, he was awesome and injured. Now that he’s been healthy for a bit, he’s been bad. That kind of player doesn’t have a ton of value on the trade market, and the Jays could use some pitching help, even if it’s just a middle reliever with a couple years of control. 2) Justin Smoak is traded for an ok back-end starter with a bit of upside (and control). I don’t expect a huge return, but I look at the Lind-Estrada trade as a decent comparable (with the added caveat that I would never expect an “ok back-end starter” to develop the way Estrada did, although that would be nice). 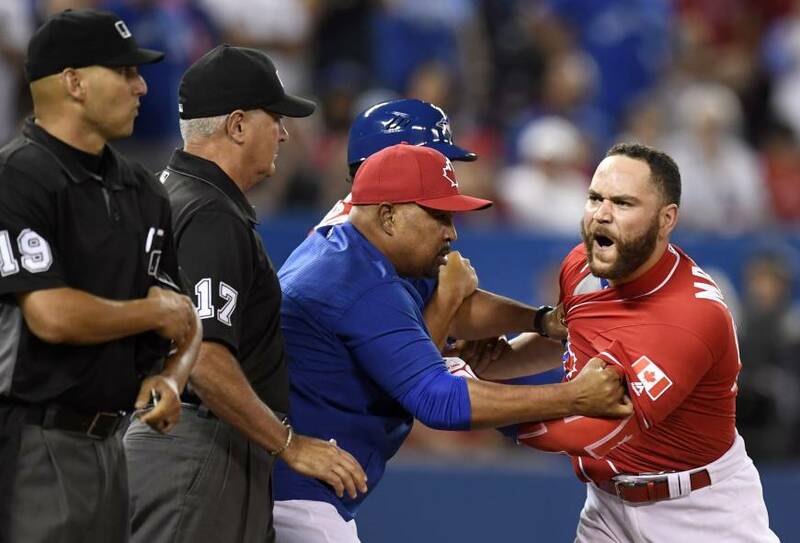 3) Russell Martin and a bunch of money is traded for a solid prospect. There’s no reason to expect a huge return here either, but I think they’ll get something of value. I’ve mentioned it plenty of times before, but Martin is exactly what a lot of playoff bound teams want: a veteran catcher capable of starting who provides plus defense, a good bat, has a fantastic reputation for working with a pitching staff, and has a ton of playoff experience. It would be an expensive financial move for the Jays to eat something like $15 million, but it would be for the best. I’ve been thinking Atlanta because of the obvious AA connection, but I’ll pick Milwaukee. 4) The Jays make a surprise OF signing. This would work hand-in-hand with a Smoak trade, as the former would clear the way for Teoscar Hernandez and Billy McKinney to get more playing time at 1B/DH. I’m not talking about a massive, long-term commitment, but I could see them giving someone like Michael Brantley or AJ Pollock a three-year deal at around $15 million per season to give them a solid, above average presence in the lineup as they head back toward contention. #BlueJays hiring Hideaki Sato to scout Japan. Has held positions with #Mariners and NPB clubs Yakult Swallows and Nippon Ham Fighters. Also served as interpreter for Yu Darvish. OR 5B) The Jays trade a depth prospect or two to take a flyer on Sonny Gray. It hasn’t worked out in New York, but Gray has some enticing upside that would be worth taking a chance on if the cost in return is reasonable. I think this group of mostly-unrealistic-but-fun-to-think-about moves helps balance the roster by taking advantage of strengths to address weaknesses. Please note, however, that you can probably put all of these moves in the “definitely won’t happen” category because I’m always, always wrong about this kind of stuff. Still, though… it’s the middle of November. We need to talk about something.